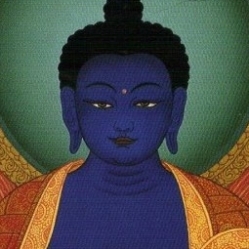 When in Kathmandu at 21, Naropa met the blue tinted medicine Buddha for the first time. 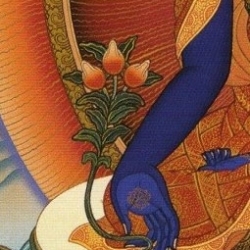 During a stay in the Sinai desert with ShantiMayi this great healer was again brought to his attention and ever since the lapis lazuli colored Buddha has become one of the applied forms. This Buddha is available to heal all suffering. The great suffering is a result of not knowing and not living our natural state of being. To eliminate this ignorance is the greatest challenge for mankind. The elimination of ignorance is the biggest medicine against all “war”, on an individual and global level. This mantra is also recited during someone’s deathbed as it has the potency to guide the person who is dying to the recognition of its immortal nature.